Games in all forms and of all types can be extremely fun and some very rewarding. Perhaps none feel more rewarding than puzzle games, which task you with solving brain-teasing, mind-bending enigmas that every so often prove to be a little more challenging than you thought they would. If puzzle games are your forte, today is your lucky day! 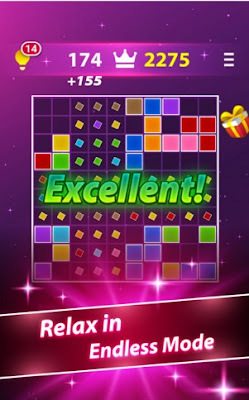 We are reviewing one of our favorite puzzle games on the Android platform, called Block 1010. Block 1010 is a simple, reliable and awesome block puzzle tetris game, perfect for both children and adults. Its developer team, EzOs, did a great job in making it beautifully designed, with catchy tune, supporting Android phone and tablets with 4.0.3 and up. Why We Like the Game? Apart from the game’s great and smooth design, it features a challenging, fun and addictive gameplay. Your main goal is to drag the pieces and match them, to fill any rows or columns and survive as long as you can without rotating the blocks. You will have the chance to choose between 3 different game modes (a Timeless mode, a Time Limit mode where you have to mind the time, and a Battle mode where you can play against other users), to get high scores and compare them on a leaderboard, to win prizes and achievements, and much more. Block 1010 Puzzle can be played anywhere – it supports an offline mode, so you can play it without Wi-Fi. Download it today for free from Google Play.